Apart from bags, women can go ga-ga over shoes! A shoe fanatic can even spent thousand of $ just to get a pair of their fave designer shoes that they can show off to their friends and for their self-gratification. You might be left with amazement if you see this outlandish and Scary Beautiful shoes designed by South African designer Leanie van der Vyver as part of her graduation theseis. I can say that this is very unique, top of the world and crazy shoes design and I don;t think anyone will try to wear this in public, perhaps Lady Gaga can pull this of. Now, would you ever consider wearing this? 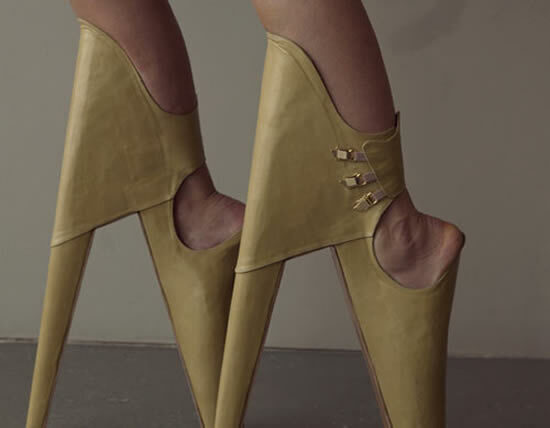 How on earth do you walk on those??? wow.. This is like alien shoes! If somebody wears this in public, it will surely grab everyone's attention! LOL!